Shah Rukh Khan's IPL team, Kolkata Knight Riders, won the match against Sunrisers Hyderabad, today at Eden Gardens. Certainly a time for celebration for the team and the co-owners, SRK and Juhi Chawla. We have earlier shared with you pictures and videos of SRK and Juhi enjoying the match at the stadium. Now, another video from the stadium is going viral on the internet. Posted by Shah Rukh Khan's fan club, this video has the actor warmly hugging a cricket fan, who was cheering for his team. The wheelchair-bound cricket enthusiast looks so happy receiving a hug from the actor. "I love you," the fan can be heard telling the actor. 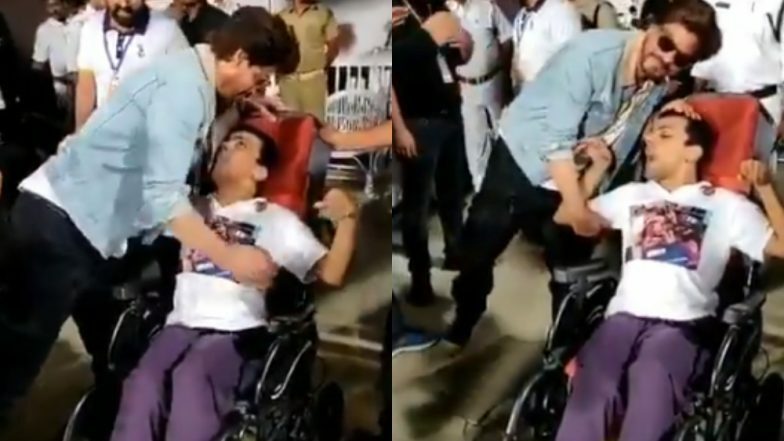 It is moments like these that make us fall more in love with Shah Rukh Khan. A few weeks ago, the actor had promised a special abled fan that he will fulfil his wish to meet him. The KKR VS SRH match was quite intense. At one point, it looked quite difficult for KKR to secure a win. But Andre Russell played an inning of 49 on 19 balls and changed the game for the team. SRH was at 181/3 at the end of their inning. KKR, who chose to ball first, had a slow start in their inning, that is until Andre led the team to victory. On the work front, Shah Rukh Khan was last seen in Aanand L Rai's Zero. The actor opted out of the biopic being made on astronaut Rakesh Sharma. The actor is yet to announce his next project. We are eagerly waiting to know what is in store for us.